Thank you all for your great comments about your favorite afghans to make! It was really fun to read all of your comments. And thank you for all the great compliments on the Amada Baby Blanket. I’m so glad it’s been well received. But, let’s get to the drawing! I numbered the 23 comments I received in order, and then went to Random.org to use their Random number generator. Big and lacey all the way! I tend to have short attention span on projects, so having a pattern that goes quick is my favorite. Monica, shoot me an email (or use the contact form) to send me your email address and I’ll pass it on so we can get you your ebook! I live in Florida, so I love motif blankets. It is too hot here to work on big afghans throughout most of the year. So motifs make it so I can get the bulk of the work done without too much in my lap. Then I can sit at a table and get the motifs joined and into a big afghan. Now, I also love quick blankets. My go-to pattern for “I don’t know what kind of blanket I want to make but I need a blanket quick” is a giant granny square. I can do those without even looking at what I’m doing, and it’s quick and mindless. I have some more blog posts brewing, so as soon as I can grab some time to write, you’ll see those. As I hinted at a few weeks ago, I’m knitting now and doing pretty well. Don’t worry, I will always be primarily a crocheter. But I can see how both art forms have their pros and cons. When I first got this new site up and running I was also in the middle of a TON of things. So much so that I left a lot of pages to be done later, with only place holders on them. The pattern page was one of those. After hearing from my fabulous webmaster that I was getting a lot of hits on my pattern pages, I realized I needed to get a move on for putting it together. So, I did. I spent this morning putting together all my photos and links and other stuff to get the pattern pages together. It’s not as pretty as I’d like it, but that’s what my fabulous webmaster is for. 🙂 I got the info in there, so now he’ll be able to pretty it up soon. So, if you want to check out the patterns I have in my Fibers By Tracie line and purchase the PDF downloads, you can find them all here on my Patterns main page. Coming soon, my full portfolio of designs published both here and elsewhere. The past few months have been very busy for me. If you follow me on Twitter, then you have seen my posts about my recent tech editing for other designers. I’ve been working quietly in the background, picking up a few projects for fellow designers who knew that I wanted to start this side of my business. So, I’m now happy to announce the launch of my Professional Services. It’s not just technical editing, although I do offer that. I can also provide pattern testing, sample making, and finishing work. One of the other things I’ve done recently was to assist a newer designer with pattern writing. If you’re a crochet designer and interested in any of my services, please check out my Services page. And then drop me a line using the contact form on the website and we’ll chat about your needs and how I can meet them. Also, keep an eye out. I’m working on some much bigger things here and will be announcing them once they’re done. Let’s just say that I’ve set some pretty big goals for this year for my business. I’m very excited about what we’ve got working in the background here and can’t wait to share them with you! I’ve got to run as I’m in a very busy weekend right now, but I wanted to announce the winner of my Simply Crochet e-book giveaway. I don’t really have a tip for saving on yarn, as most of my projects are small (amigurumi) so only use a fraction of a skein apiece! I suppose my best tip is to always keep leftover yarn, even if it’s only a few metres long, because you never know when you’ll need to make a small embellishment and find you have the perfect shade to hand already. And with that, I’m off! Have a great weekend everyone! I’ve been doing something related to crochet professionally for over four years now. For the most part, I’ve been designing and teaching exclusively. These have been enjoyable, but I needed to branch out and find a way to bring more revenue streams into my business plan. If you’ve been a reader for a bit, you know I hit a burn out stage with my designing over the summer. I’m still on break, or as I’ve started calling it for the time being, semi-retired. I have no set date on when I’ll pick up the hooks to design again. My brain and my designer soul needs to have the pressure free space to just breathe and just be. I’ve been crocheting for fun again, and rekindling that love of feeling the yarn move through my fingers and my hook to create beautiful things. Teaching here in Florida has always been tough. Especially over the summer. Now that the temps are starting to cool off and the snowbirds are returning, I hope my classes may start filling. But I cannot rely on that to provide the bulk of my income for the time being. So, today (with the arrival of UPS) begins the start of a new venture for me. I’ve done some casual pattern testing in the past, but now I’m starting to do official testing and tech editing. A very dear designer friend has agreed to be my guinea pig and be my first official tech editing client. I’m also doing a testing and tech editing combo for another designer friend. I’m excited about this. I’m also a little nervous, hoping that I can do it efficiently and correctly. I’ve been told I have a great eye for detail, so I’m hoping it will work in my favor now. I’ll add information to the Services tab of my site here as soon as I get through these first ones. For the time being, I can only tech edit non-sized items (so no garment grading math) at the moment. I may expand into garments once I am a bit more secure in my skillset. Oh, and in case it needs to be said, I only test and tech edit crochet items. So if you’re a fellow designer and need a tester or tech editor, I’m starting to branch out into that, so contact me if you need someone! Item #3: This one is really good news. The urge to crochet has bit again (which is good ’cause I was getting worried). 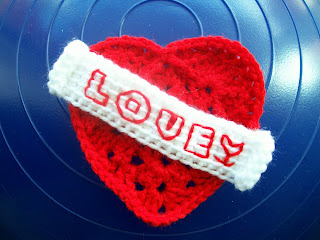 I spent this weekend crocheting away on fun stuff for myself and for gifts. I’ve also got some little sparks of inspiration I’m hoping to fan into flames of designs, but we’ll see. I’m not pushing or rushing anything that’s going on right now. Thank you all for your support! Item #4: If you wanted to get my pattern for the Fearless Scarf but didn’t get a chance to vote in this last round of Flamies awards, fear not! I wanted to have a period of exclusivity for the pattern (and to encourage everyone to go vote), but I was given the go ahead to release the pattern in my line. So…next week come back here for an announcement. 🙂 It will be available and I’ll have all the info then. I need to do a double check and clean it up and get it ready to go. Okay, that’s all from me for this week! I hope everyone is having a wonderful day and a great start to the week. Stay cool, all! I’m going to be teaching at Chain Link! Finally, I can announce my big announcement! I’m going to be teaching three classes this summer at Chain Link (aka the Knit and Crochet Show) in Manchester, NH, July 8-10th. T102C-Ami, Ama, the little Crocheted Toys! (Crochet) This class will be Thursday AM from 9am to noon. If you’ve ever wanted to make those cute little amigurumi and wondered how to get started, then take this class! We’ll go over the basic tools, the various types, how to read symbol only ami charts, and how to design and make your own. It’ll be lots of fun so come on out! F212C-Broomstick Lace Cloth (Crochet) This class will be Friday PM from 2pm-5pm. This class is based on my Broomstick Lace Cloth pattern and will be a great intro to broomstick lace. We’ll be doing the project in class and depending on how quick you crochet (and catch on), you could have a finished project by the end! S308C-Everything You Wanted To Know About Felting, But Were Afraid To Ask (Crochet) This class will be all day Saturday. I’m the most excited about this class. If you’ve ever been intimidated by felting, come take this class. We’ll be felting in class! We’ll also go over different stitch patterns and how they are affected by felting. We’ll also explore color and how it affects the felting process. I’m extremely excited about this opportunity to teach and I’m looking forward to seeing everyone up at Chain Link!!!! I hope you’ll make plans to be there, too! Upcoming classes, important announcements, etc. 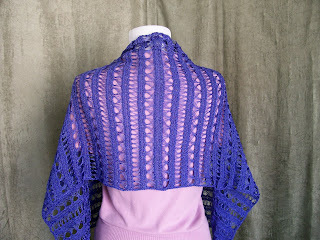 This Saturday (2/27/10), I’ll be teaching a workshop on my Broomstick Lace Wrap at A Good Yarn Sarasota. The class is from 1-3pm and is only $35. That gets you the printed pattern, my help to get you started, and instruction on ways to customize the wrap. If you’re interested, there is still room in the class. Call the shop and reserve your spot today! 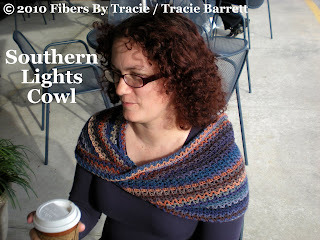 On March 20th, I’ll be teaching a workshop on my Southern Lights Cowl at the shop. The class will be from 1-3pm and only costs $30. This will be an exciting class and again, you’ll get the printed pattern, some great tips and tricks, and help with the project. In other news, remember, my Help for Haiti pledge is still going on through this Monday. 50% of my pattern sale proceeds from all the pattern sales up to Monday will go to Doctors Without Borders for relief efforts in Haiti. Just because the news isn’t covering it anymore, doesn’t mean there aren’t still people needing help. Won’t you be a part of it? Also, the Gulf Coast Crochet Guild of Florida will be having a work day meeting next Saturday (3/6/10), from 11:30-1:30 at A Good Yarn Sarasota. We’ll be tagging items and preparing them for hospital deliveries. I’m excited about this, because for a small chapter I know we’ve been working hard to make others lives a bit happier. If you’re in the area and would like to join us, please do! We’re always happy to welcome new members! And what have I been working on? Well, I’m busy with a publication project (which will come out later this year), pushing submissions out the door so I can keep doing publication projects, and working on ideas and designs for my design line. There’s some great things coming down the pike, and I can’t wait to share them with you. Today is our three year anniversary! Three years ago today I was getting ready to leave work and go on my first date with John. And Saturday will mark a year engaged. Yeah, it’s a busy lovey dovey week for us here this time of year. I wanted to stop and announce a few things. Thing the first: I have a Felted Coasters workshop this Saturday at A Good Yarn, Sarasota. There’s still room, so if you’re interested and in the area, call the shop at 941.487.7914 to secure your spot. Thing the second: I’m about to release two new patterns on Monday. Keep an eye out here as I’ll post about them as soon as I get them uploaded. Thing the third: Watch this space as well for a big announcement in the next month. As soon as I know the full details and can give them to you, I will. It’s very exciting and I can’t wait to tell you. Thing the fifth: Have a wonderful Valentine’s Day weekend, everyone! Whether you’ve got someone in your life or not, remember, you are your best Valentine! So be good to yourself this weekend! I made this for John one year. So it works for both holidays! My big announcement is something that I’ve been thinking about for well over a year. I finally decided after coming home from Chain Link that I needed to just bite the bullet and do it. I want to start a chapter for the Crochet Guild of America. So, to help get excitement building, I’ve started a Yahoo group and a Ravelry group for the South Hillsborough County Crochet guild. The name may change once we have our first meeting, but for now that seemed to work. I chose southern hillsborough county to be able to reach out to Pinellas and Manatee counties as well. Well, that and it’s close to me and to at least get started, I need it nearby. The first meeting will be Saturday, October 3rd from 12-1:30p. The location will be announced on both groups once it’s confirmed. My goals for the chapter are to do local charity work, demos, and education (both within the group and to others). I’ll be teaching a demo in amigurumi at the Sarasota Fiber-In on Saturday, September 19. I’ll be teaching from 10:30-11:30a. If you’re in the area, come on out and help support crochet! There will be a lot of other demos as well as vendors. Check out the website for more info. I’m looking forward to being a part of it. Okay, that’s all from me for now. 🙂 I hope to have more info to share with you soon.